Who is the motherfucking managing editor around here? Whoever it is has fallen down on the job, that's all I have to say. November 4th? The last post was November 4th? I don't like that it has been so long. I hope to get back to a more regular posting schedule. I think it is mostly a matter of getting back in the habit and also figuring out how to use my laptop on my actual lap instead of at a desk, which is where I've always written before but where I spend far less time than I used to. Anywho. I figured that since I've been away so long, I'd catch you up on stuff. Let's see... Well, it's December; how did that sneak up on us? 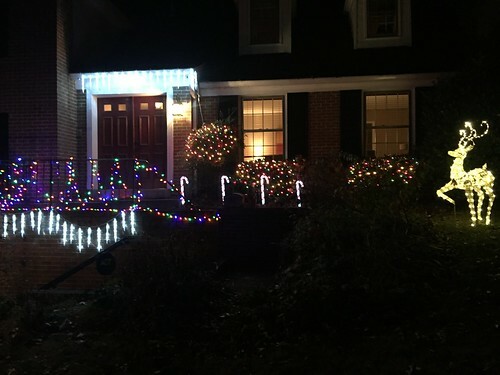 We spent the Thanksgiving weekend decorating the outside of our house for Christmas because Alex says it's less depressing to come home from work late at night when there is a festive deer and candy canes outside. I'm not sure what that says about his attitude about seeing us after a long day, but I'm not going to look at that too hard. As for Thanksgiving itself, we had a lovely day. 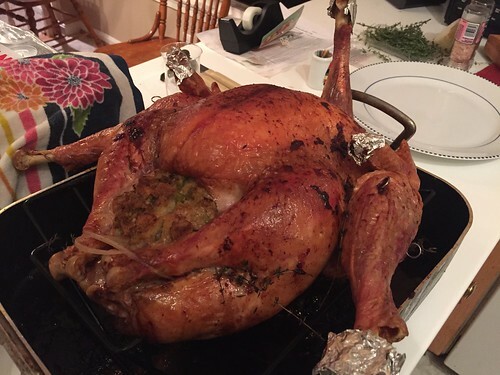 We hung out and ate and we had a five-legged turkey. Did you know that you can buy EXTRA turkey legs? You should do it. We call it a beetle turkey. It eliminates a lot of screaming at the Thanksgiving dinner table due to the traditional 3:2 children:turkey legs ratio. These are amazing. She totally nailed all of their markings. Incredible. So that's Thanksgiving. What else? Jack's play is this weekend. I am so proud of him. He originally had two nonspeaking parts in the play, but at some point, the teacher eliminated the scene in which he had his bigger part, so now he has a veeeerrry small part somewhere in act two. But you know what Jack has done? He has spent HOURS at rehearsal. He has done so with good cheer and enthusiasm. He is ready to perform and I could not be more proud of him. He has definitely struggled a little and I'm actually more than a little bit annoyed about some of the ways things have gone down over the past couple of months, but none of it is on Jack. He is a motherfucking champion. I'm so lucky he's my kid. I'll let you know how the play goes. I haven't decided if I want to or should write about the stuff that's pissed me off—most of it is how non-inclusive after school activities really are in practice—but I will absolutely come back and post photos of how awesome my kid is. Sam is busy preparing for a test he has to take to get into the high school program he wants to attend. He's also preparing for the three band concerts he has next week. The next seven or eight days are going to be pretty intense. So, all in all, pretty all right. Are we caught up? Am I properly chastised for my absence from this page? Are we all wishing Jack to break a leg this weekend? Okay then, I will see you soon! You are an awesome person. I love hearing good and bad. Love to front of the house. I use to decorate but since my husband passed I don't do diddly. I get lazier as I get older... all my friends except 1 will be with family so dunno what we will do. My family Hanukkah party is up north and I am in So FL so Hanukkah is out. I have so few Jewish friends down here. My husband was Catholic so I got to enjoy both holidays and it was great fun. 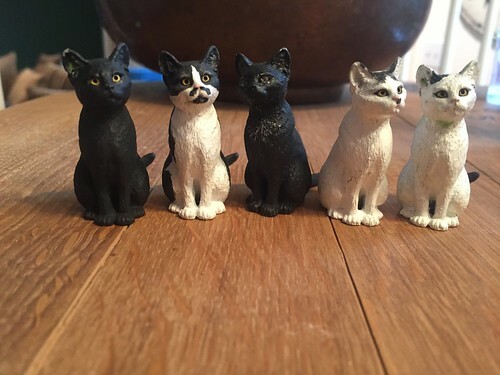 Did your mom make the cats herself? They are precious. Do the cats love them or do they hiss at them? Break a leg, Jack! Good luck on the test, Sam! 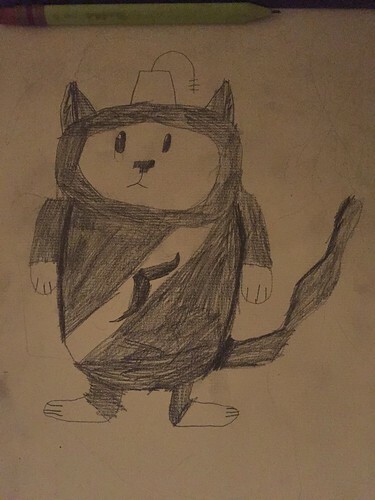 Awesome drawing, Quinn! Happy holidays, everyone plus squirrels! Love the cats - both MIL cats and Quinn cat. Break a leg, Jack. Wish I could be there. And good luck, Sam. The front of your house is awesome and festive. And that turkey is kind of -- weird. Thanks for posting again. Look forward to the next one. I hope the play went well - and suspect I'll see you at one or two of those band concerts.